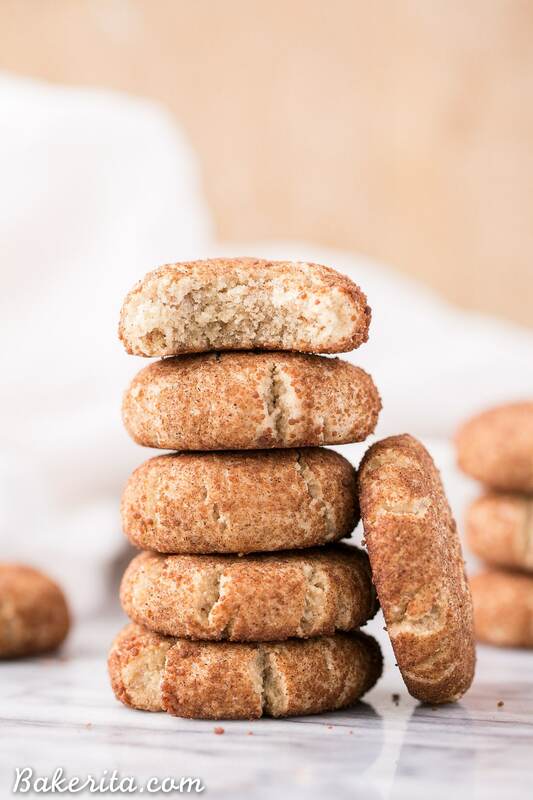 These healthier Snickerdoodles are incredibly soft and flavorful. This gluten-free, Paleo, and vegan recipe comes together so quickly and easily in just twenty minutes, you won’t believe it! It’s somehow already December 23rd – 1 day until the first night of Hannukah, 2 days until Christmas, and 8 days until New Years Eve. I’m squeezing in one last cookie recipe before everyone goes on a diet or cleanse or whatever. 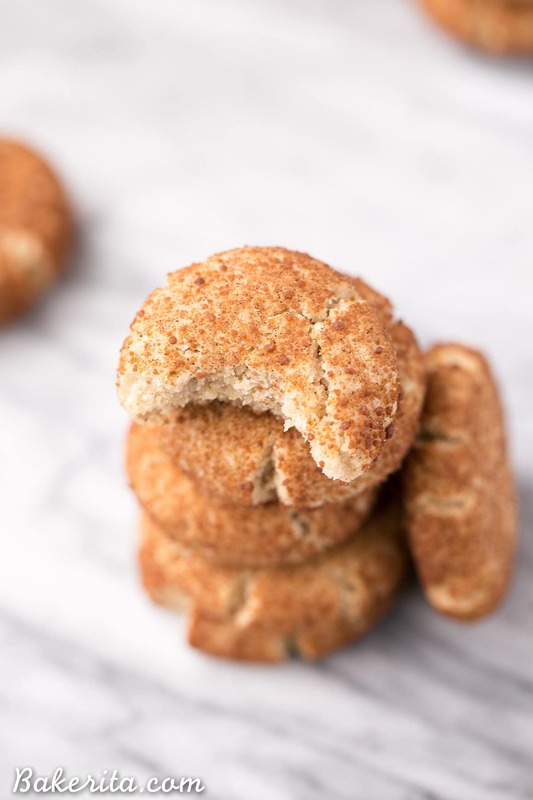 This one is a classic that I actually haven’t ever posted a recipe for, the snickerdoodle cookie. Traditionally full of sugar, butter, and cinnamon, it’s a soft and chewy cookie that gets rolled in cinnamon sugar before baking. It’s also usually not very healthy – at all. 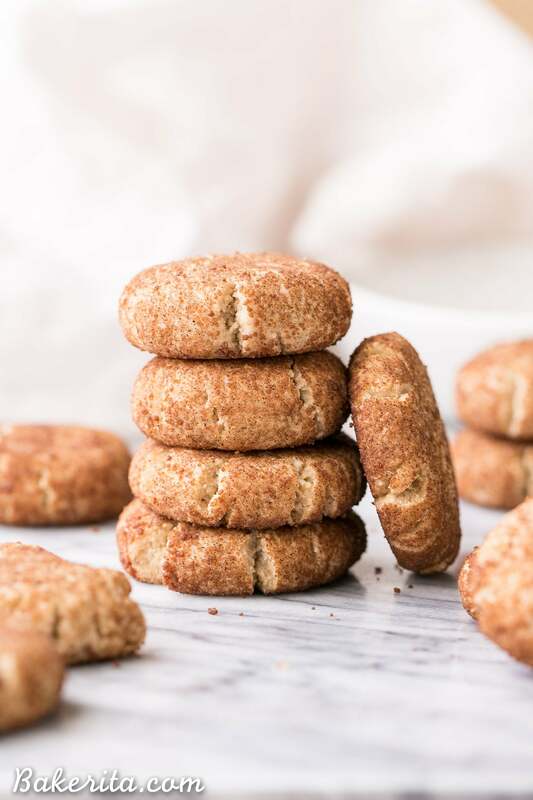 When I questioned my Instagram followers on any holiday favorites they wanted to see made a bit healthier, @dianacooke requested healthified snickerdoodles. Diana, your wish is my command! These paleo and vegan snickerdoodles were a resounding success. 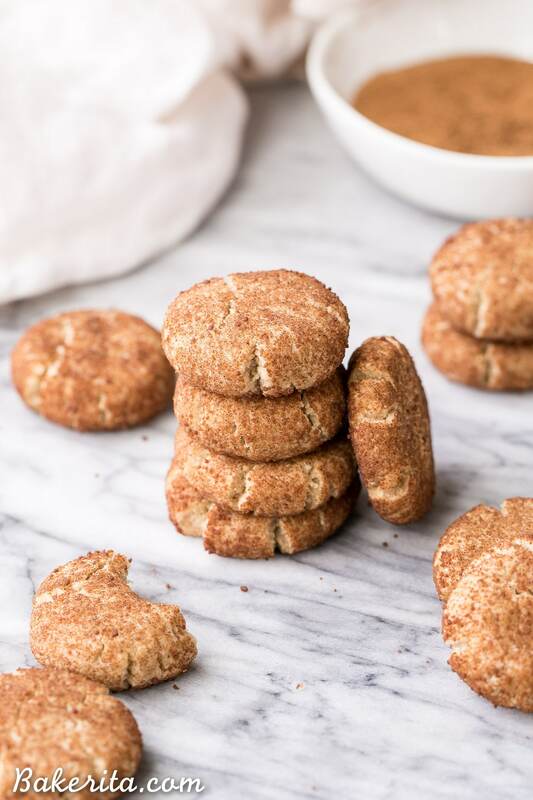 The combination of almond and coconut flours created a soft and tender cookie, and the cream of tartar helped provide some of that classic snickerdoodle taste. A little bit of maple syrup is all the sweetness the cookies need, especially because they get some additional sweetness from their roll in the cinnamon + coconut sugar mixture before they hit the oven. The dough comes together in a flash – a bowl and wooden spoon are all you need, and no chilling of the dough required! This dough is also weirdly light and fluffy, because of the coconut flour, and it makes it super fun and easy to work with. The cookies don’t spread a ton, so you do have to pat them down before baking so they end up flat. They puff up a bit, and you want to pull them out when they’re just baked through – don’t over bake or they’ll be dry. We’re aiming for soft cookies here. So, if you can spare 20 minutes in the craziness and you’re not already swimming in cookies, you might want to bake up a batch of these! This is my last new recipe post before the New Year, so I hope you all have wonderful Christmas, Hannukah, and New Years celebrations full of happiness, family, and delicious food. Wishing each and everyone of you tons of love and happiness in 2017! You have all made me very happy this year ❤️ happy holidays, friend! Preheat oven to 350°F. Line a baking sheet with a silicone mat or parchment paper, set aside. In a mixing bowl, stir together the almond flour, coconut flour, baking soda, cream of tartar, salt, and cinnamon. Add the coconut oil, maple syrup, and vanilla extract and stir until throughly combined. In a separate small bowl, make your cinnamon sugar by stirring together the cinnamon and coconut sugar. Using a cookie scoop or spoon, measure out about 1 heaping tablespoon of dough and roll into a ball. Roll each cookie dough ball into the cinnamon sugar mixture. Place on prepared baking sheet about 2 inches apart. Flatten cookies slightly with your palm or the flat bottom of a glass. Bake for about 10 minutes, until golden brown. Let cool for 10 minutes and then transfer to a cooling rack to cool completely. They must be sooo good. Using coconut sugar sounds just so good. Coconut sugar is one of my faves! Thanks so much, Neni. I’ve said this before and I’ll say it again, you are the paleo baking queen! You’e the sweetest!! Thanks so much. 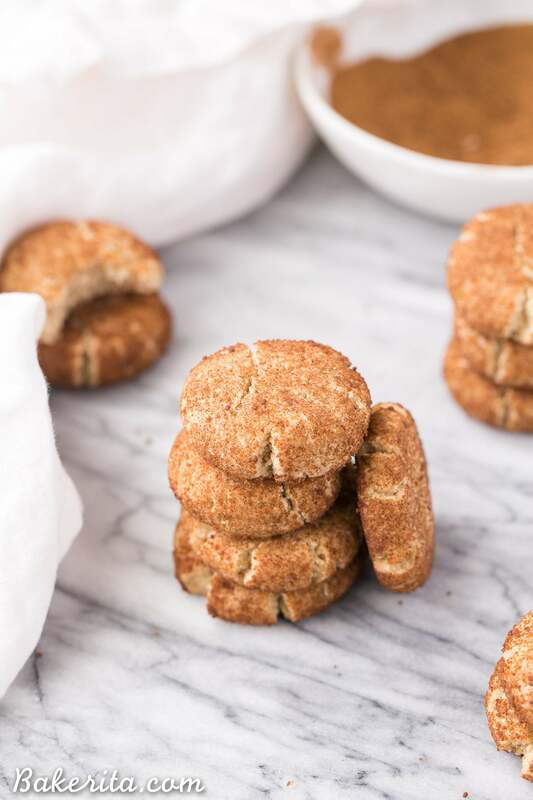 These look so soft and pillowy, snickerdoodle perfection! Snickerdoodles are my favorite cookie! And you really can’t go wrong with a classic like this. Love how thick and chewy these are, Rachel! You nailed this recipe! Hope you had a wonderful holiday, friend! I can hardly staaaaaaand how thick and puffy these snickerdoodle beauties look, Rachel! Totally craving these to go with my morning coffee right now!! These are FANTASTIC!!! Thanks so much for sharing. Can’t wait to try the gingerbread ones!! Hi Samantha, did you mean a nut allergy? Unfortunately, coconut flour is MUCH more absorbent than almond flour (generally about 3x as absorbent) so you can’t do a 1:1 sub. You could try using a total of 3/4 + 1 tbsp coconut flour, OR sub the almond flour for oat flour. Haven’t tested either of these though, so can’t make any guarantees. Hope this helps! I noticed there are no eggs in this recipe. Is that correct? I am in the middle of making these cookies. Yes, they are vegan cookies so there are no eggs.